Whether you’re celebrating your best friend’s engagement or just trying to make it through a Tuesday with your coworkers, every party deserves a bit of VIP -- and nothing says “VIP” like 360° views of LA. 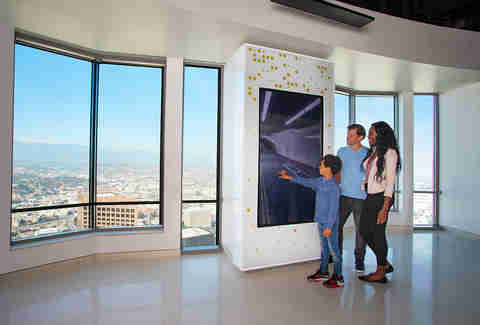 Towering 1,000 feet above downtown on the 54th, 69th, and 70th floors of the U.S. Bank Tower, OUE Skyspace is home to California’s tallest open-air observation deck. 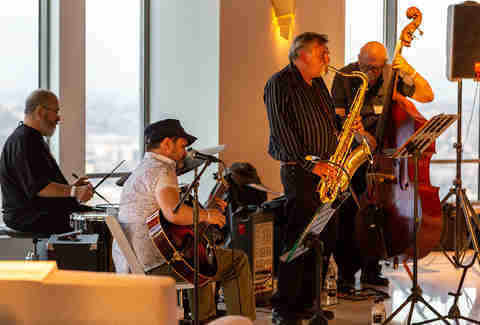 The venue recently opened four exhibits on their 54th floor that showcase the city’s influence on arts and culture: “Scene In,” “Heard In,” “Played In,” and “Only In” LA. 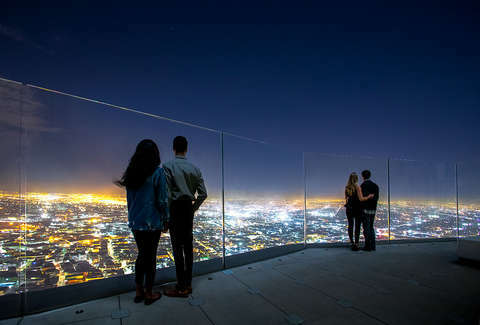 On top of that, you can snap bird’s-eye view pics of quintessential LA landmarks (think the Capitol Records Building and the Hollywood Sign), dare your friends to try the 45-foot glass Skyslide above the city, make a toast to your crew in their decked out bar, or luxuriate with a custom event package. Because the spot has so much to offer, we broke down every excuse you need to visit OUE Skyspace -- so get planning. Locals understand the pressure that comes with building an itinerary when the fam visits. (That’s to be expected, seeing as LA has over 250 neighborhoods to explore.) Thankfully, OUE Skyspace is in the heart of downtown, making it the ideal spot to kick off your tour of the city. Start your visit on the 54th floor, where the history and culture buffs can sink their teeth into the just-opened “Only In” exhibit. Here, you’ll find facts about each neighborhood to help you nail down where to sightsee next -- did you know there are 2,500 stars on the Hollywood Walk of Fame? -- as well as prepare you for your next trivia night. Those clinging to their cameras can snap Dodgers Stadium to the north east, Catalina Island to the west, and every sight in between from OUE Skyspace’s two open-air observation decks, too. It’s an experience that your family (read: tourists) and you (read: the local) can geek out over together -- no matter how long you’ve called LA home. When it’s time for the new season of your favorite show or the premiere of that long-awaited movie, it’s a reason to celebrate -- so why not give you and your friends a reminder that you live in a city that’s defined modern film for over a century? At the “Scene In” exhibit at Skyspace, you can explore how some of the biggest names in cinema have launched their careers here, with the Hollywood Sign as your backdrop. You can even make an entrance by strutting through the 54th floor on your own red carpet, complete with a paparazzi camera wall that will document every moment. Continue to bask in all the Hollywood glamour by learning about movies filmed in or about LA at an exhibit that’s bound to give you another reason to re-watch all your favorites. When it comes to finding a spot for a professional happy hour, you have a singular goal: picking a bar that’s close by, but still feels like an escape -- so, why not head 1,000 feet above it all? The newly opened Skyspace Bar is a chance to show your coworkers that there’s a better place to de-stress than the dive bar down the block. Libations come in the form of signature cocktails and premium Southern California vino. No need to start a bar crawl to try the city’s greatest homegrown beer, either. Skyspace Bar offers a taste of LA’s trending craft brewery scene, served up with a serene backdrop of the city. We’re sure your coworkers will agree: everything tastes better when you’re this far from your desk. Why hike to the top of Runyon Canyon when you can fly down a 45-foot glass-enclosed slide 70 floors above the city for the same adrenaline rush? OUE Skyspace’s Skyslide, the first slide of its kind in the country, starts at the top of 70th floor. Once you’re up there, grab a mat and wiz down the slide that will make you feel like you’re flying 1,000 feet above downtown LA. With insane bird’s-eye views of public street art and Pershing Square, it’s the coolest way to see the top of the city sans hiking gear. It’s no secret that LA has one of the country’s greatest music scenes (they host the Grammys here for a reason). That’s why OUE Skyspace offers live music events from jazz quartets to DJ sets and silent disco parties on a multi-level dance floor. If an event isn’t planned during your visit, you can still stop by before your next big concert downtown for a quick LA music history lesson. Their new “Heard In” exhibit on the 54th floor features stories from LA’s most prominent music personalities and artists, as well as historic concert posters, and a timeline of vinyls recorded in the city. There’s even a music recording booth where everyone can test their karaoke skills to tracks from LA greats…including the rare opportunity to belt out “California Dreamin” and realize you actually are. Just like sunshine and burritos, yoga and LA are synonymous with each other -- and OUE Skyspace offers an over-the-top way to change up your average session. Break away from traditional hot yoga with your fellow yogis by joining “Sunrise Yoga in the Sky,” OUE Skyspace’s elevated take on the practice. Beginning in April, classes will meet at 6:30am on the first Saturday of every month -- and working on downward dog as the sun rises against the skyline is about as zen as it gets. After you find your center during the one-hour class, you can close your practice with a complimentary ride on the Skyslide, because few things will make you stay present like zipping down a 45-foot all-glass slide above the city. With tech giants headquartered in Silicon Beach and fashion, finance, and media companies operating all over the city, LA brings in visiting professionals from just about everywhere. Naturally, figuring out how to make the most of a 24-hour break with the team can feel daunting in a city of 4 million, so head to the top. With the Sun & Stars Day Trip at OUE Skyspace, groups get two entries per ticket within 24 hours. That means you’ll be able to snap pics of LA just as it wakes up, and then come back at night after a day of sightseeing to catch golden hour in front of the Hollywood Sign and Staples Center. It’s further photographic proof you can use to convince your friends to take their next trip out here with you. No work required. When it’s time to ditch the couch for the game, hosting your next watch party at the new Skyspace Bar will make every big play much more celebratory. With drinks and small bites flowing throughout the entire game and a 360° backdrop of LA, there’s plenty to raise your spirits even if your team loses. Before the game starts, be sure to hit up the new ”Played In” experience on the 54th floor, where sportscasters give the rundown on all things LA sports -- including extreme sports like skateboarding and surfing. There are faux lockers that showcase almost every LA franchise as well, like the Chargers and the Kings, so prepare for plenty of photo ops. Saying “I do” or finally popping the big question is all about the atmosphere (and definitely not forgetting the ring.) OUE Skyspace’s custom marriage proposal package can help set the backdrop for an Insta-perfect proposal with friends and family all in attendance. They also have the big day and anniversary celebrations covered with in-house amenities like food and beverage catering services, a DJ-ready sound system, valet parking, and of course, the Skyslide. Two open-air terraces offer 360° views of all the iconic LA landmarks that made you fall in love with the city in the first place -- with all the people you love in attendance to celebrate it with you. Plan your trip today. Use promo code Thrill19 at OUE-Skyspace.com to redeem a special offer.